Nineteen state DPHHS outreach offices have closed. What does this mean for Montanans? 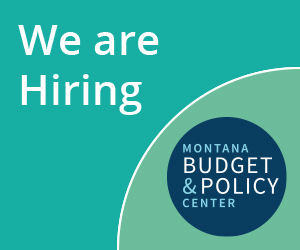 This blog is the first in a series to identify community impacts of state budget cuts – and how these cuts impact the lives of everyday Montanans. We’ll start with the cut within the Department of Health and Human Services (DPHHS), which has resulted in the closure of more than half of the state’s outreach offices that serve rural, low-income Montanans in the central and eastern part of the state. If you didn’t already know: The legislature has made a series of deep cuts that have disproportionately hit health and human services. To make matters worse, generally whenever the state cuts health service funding, it almost always comes with a loss in federal funds. The $49 million of general fund dollars cut in the special session will also result in a cut of over $60 million in federal funds, totaling nearly $110 million cut in services to our communities. Prior to the special session, the Montana Food Bank Network warned of the crippling impact that further DPHHS cuts would have on low-income families. Still, funding for more than half of the state offices of public assistance was cut and 19 offices will close at the end of January. The closures mean that the state will save $700,000 in general fund dollars over the biennium and will therefore cost the state over $1 million in lost funding because of the lack of matching state dollars to draw down federal funds. But these cuts are about far more than just dollars. Montanans will lose their jobs and many more will lose their local connection to access critical support systems. The offices to close are located in Big Timber, Chinook, Choteau, Conrad, Cut Bank, Deer Lodge, Dillon, Forsyth, Fort Benton, Glendive, Livingston, Malta, Red Lodge, Shelby, Sidney, Plentywood, Roundup and Thompson Falls. In Stillwater County, 146 people on average enter the Columbus Field Office every month seeking assistance. In Livingston alone, 3,301 people are enrolled in Medicaid. In Sidney, there are 688 people receiving SNAP benefits. OPA offices in Livingston, Sidney, Columbus, Glendive and Red Lodge have the greatest number of in-person visits per month of all the OPAs to close, with 369, 223, 146, 122 and 114 visits, respectively. While DPHHS transitioned to a new model for those who need assistance utilizing a system of online and phone access, many still prefer to visit the offices in person. According to this article from the Daily Inter Lake, people like Kari Merrill of Kalispell have spent hours sitting in the office of public assistance waiting room, but she said she’s rather deal with the two-hour wait in the office than deal with the department’s call system. Prior to the cuts, OPA staff across the state were already overwhelmed with calls and in-person visits. Now, imagine more than half of the offices that already receive an overburdening number of calls and visits close their doors. For parents such as Matthew Lambert, a Bigfork resident and father of two, applying for SNAP benefits took days longer than it should have because when he went down to the Kalispell Office of Public Assistance in person, there was a line of nearly 20 people in front of him. Lambert told the Daily Inter Lake that it took about 2 1/2 hours of waiting to speak with a representative to claim food assistance to help feed his two kids. If clients do need handle paperwork in person, but their local office has closed, they will have to travel to other offices. As Montana Public Radio reported, someone like Raye in Livingston who does not have a car will have extra hardship to access help and benefits, which have been a lifeline to her as a domestic abuse survivor. The cuts to DPHHS and the office closures will hurt our state’s most vulnerable families, Montanans with disabilities, seniors, and kids. Instead of opting for common-sense revenue proposals, the state opted to create larger barriers for low-income people to access benefits such as SNAP and Medicaid, which help to lift people out of poverty. Montana needs to change course and adequately invest in the public institutions and services that educate our children, keep our communities safe, and provide health care and other services to our neighbors.